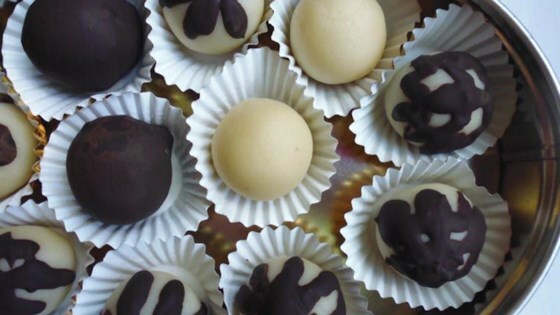 "It is super easy to make your own marzipan. This authentic German recipe is made without eggs and needs only 2 ingredients, whole almonds and confectioners' sugar. If you like, you can flavor it with almond extract or rose water. Use the marzipan within a week or two." Place almonds in a heat-proof bowl and cover with boiling water. Let stand for a few minutes until cool enough to handle. Slip the almonds out of their skins one by one, leaving the remaining almonds in the warm water. Drain almonds in a colander. Place almonds and confectioners' sugar in the food processor fitted with a metal blade and process to a paste. Add cold water, 1/2 to 1 teaspoon at a time, if the paste is too dry. Scrape the sides a few times to ensure even processing. Add a few drops of almond extract towards the end of the process. Process marzipan until it is smooth and no longer grainy. Wrap in plastic wrap and store in a cool, dry place. You can also use rose water instead of almond extract. The easiest way to remove the skins of the almonds is when they are wet. Do not use already peeled almonds as they will have a drier consistency.